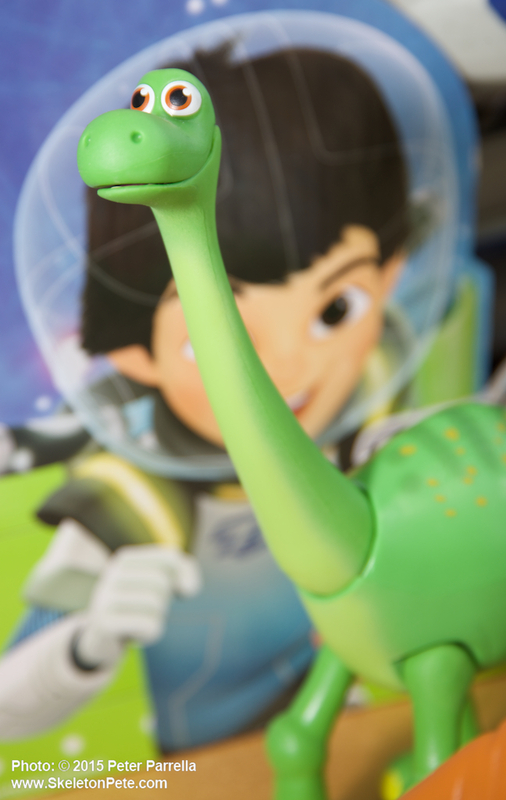 “The Good Dinosaur” Arlo, the young hero of Disney/Pixar’s newest collaboration. Between the rush of excitement and that Japanese language course you took to help dissect the nuances of the recent Star Wars: The Force Awakens trailer, you might have missed The Walt Disney Company sliding another film in under your noses. The Pixar collaboration titled The Good Dinosaur has been brewing in the background for some time. Now, with the kinks worked out of its bones, it will hit theaters, on November 25, 2015, as a sweet Thanksgiving dessert for your youngsters. A SkeletonPete “Yester-Play” Tribute to the War That Time Forgot Series. Here’s a photographic homage to those thrilling days of “yester-play.” It’s first in a series I hope to continue as the muses allow. The idea is to periodically root through my old basement toy barrel for inspiration and attempt to artistically photograph whatever I pull out. The first “excavation” yielded this fanciful two-headed Tyrannosaurus and triggered a remembrance of one of my favorite comic book series, Star Spangled War Stories. Some of my earliest comic book encounters came when my parents or grandparents would walk me to the corner candy store to peruse the newsstand and there before my wondering eyes would be a new issue of DC Comics’ Star Spangled War Stories. Why was Star Spangled so special? Well, because in May of 1960 (with Issue #90) DC began an incredible run of stories that mashed up World War II tales with a land-that-time-forgot motif. 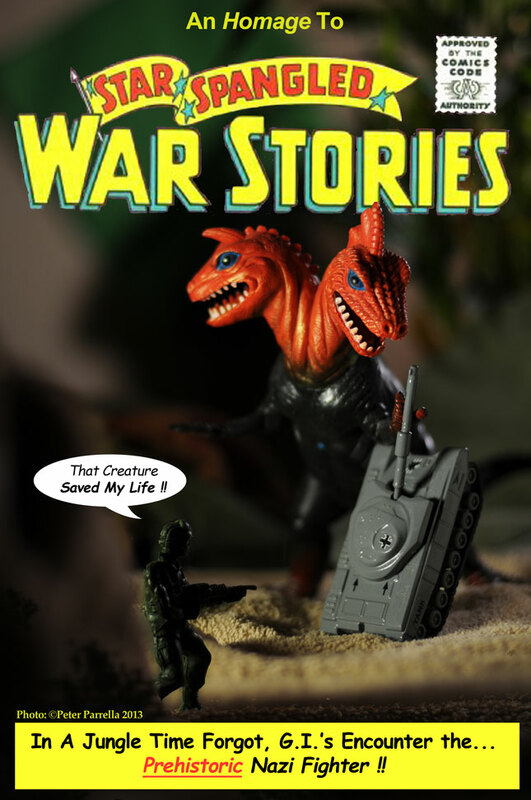 In other words, G.I.’s versus dinosaurs stories. Usually heralded by spectacular Joe Kubert or Ross Andru/Mike Esposito rendered covers, they launched me into innumerable hours of pitting my John’s Bargain Store green plastic soldiers against an onslaught from my Louis Marx dinosaur collection. So here for your approval is my imagining of a Star Spangled tale never told. As with my Safari Ltd. “Good Luck Mini’s” tribute to King Kong, this shot was staged as a table-top tableau using bath towels, house plants and garden rocks for the scenery. The really neat metal tank was a serendipitous discovery in the local 99 Cent store, as was the G.I. in the foreground. 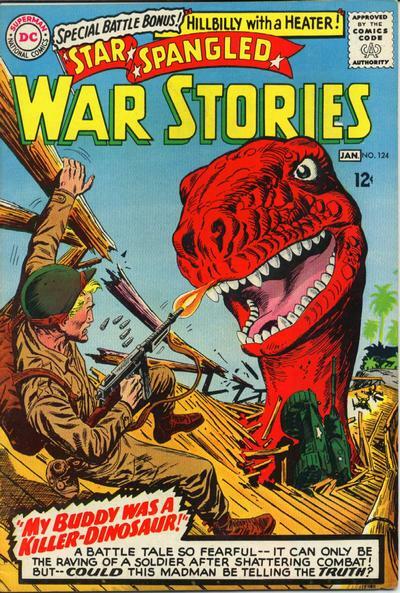 This Cover for Star Spangled War Stories #125 Typifies the Dinosaur Island Series. For more information on the original books, here is the Wiki. All the great covers can be found in DC Comics’ Archive. 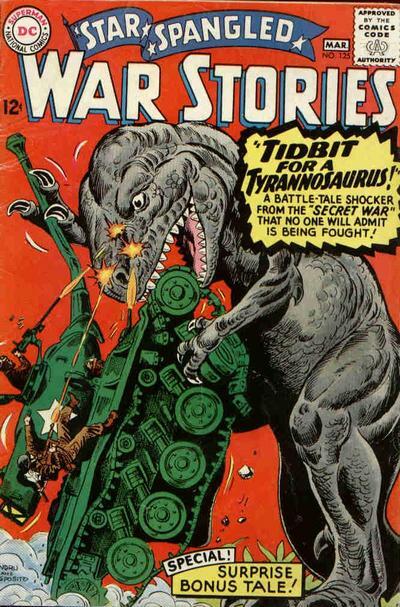 The “War That Time Forgot” and “Dinosaur Island” stories began with Issue 90 and ended with Issue 137 (March 1968,) after which the book became a vehicle for the Enemy Ace character. DC Comics recently announced plans to revive the Star Spangled War Stories title with issue #1 arriving in July 2014. Focus will be on a G.I. Zombie character, but I can’t imagine that the temptation to revisit the land of tanks vs. dinosaurs can be resisted.